Located one hour north of San Francisco, in the lush, idyllic wine region of Sonoma County, Santa Rosa, California is a community expanding to keep pace with its developing agritourism industry. A city that once thought of itself as a town is now home to over 150,000 residents, making it the largest city north of the Golden Gate bridge. As Santa Rosa redefines its identity, its leaders have worked to envision how they want their citizens to view their developing and expanding city. 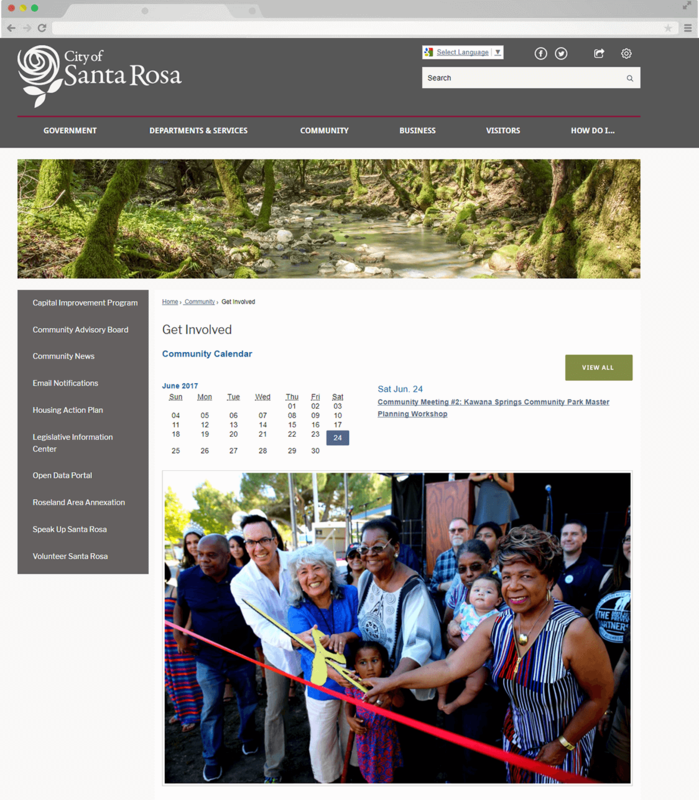 An important component of Santa Rosa’s civic engagement efforts surrounded the building of a new civic website that better represented the unique culture and vibe of the city and its residents, and one that would serve as a platform for civic discussions. 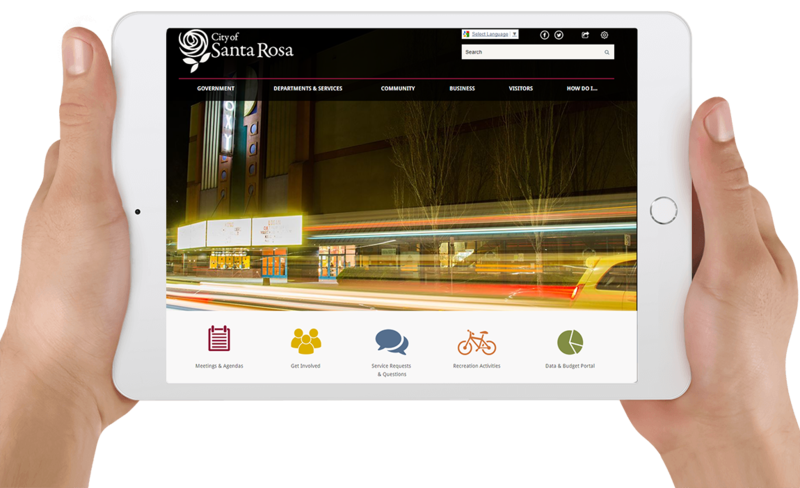 For help rebranding this central communication tool, Santa Rosa turned to the local government experts at CivicPlus®, and its powerful CivicEngage®content management system (CMS). “One of the best things we did was have individual, on premise visits between the CivicAdvise consulting team and our individual departments. Each department brought its own perspective to our website redesign project, but our City Manager was ultimately responsible for building a single website with a city-wide look and feel." Before transitioning to a CivicEngage website designed and built by CivicPlus, Santa Rosa’s city website was about eight years old. 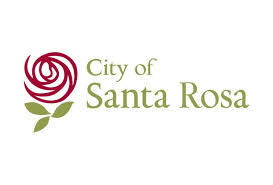 To ensure a streamlined implementation process in which all stakeholders provided input on the redesign, Santa Rosa formed two internal implementation teams. The core group of stakeholders included five administrative personnel. This smaller team was primarily responsible for establishing the website architecture, branding, design, and functionality. The second group was comprised of one or two representatives from each of Santa Rosa’s 14 civic departments. Each was responsible for managing their department’s content strategy. For the internal team at Santa Rosa that would serve as the core website design and implementation decision-makers, one of the greatest benefits of working with the strategic consulting team from CivicEngage was the opportunity to learn best practices in local government website design and functionality from a team that focuses solely on similar website design projects. Another key aspect of Santa Rosa’s redesign process was to ensure its new website would be compliant with requirements of the Americans with Disabilities Act (ADA). “Our CivicEngage team helped us to be ADA-compliant,” said McHenry. Santa Rosa’s CivicEngage project management team successfully kept the City’s website implementation on schedule, and on task. According to McHenry, the on-site, one-on-one department meetings that the City had with the CivicAdvise team were essential to devising a successful content strategy. 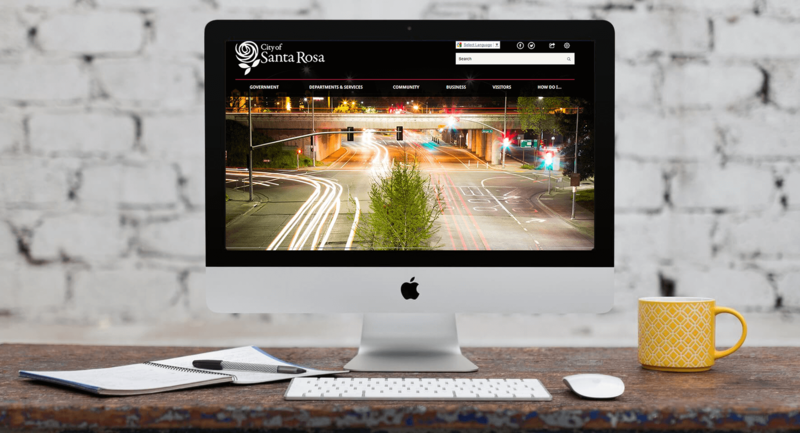 With its initial goal of replacing its old website with one that is more highly functional and stable complete, the City of Santa Rosa is focused on continual evolution and progress. As an immediate next step, McHenry and his team plan to explore the capabilities of the available CivicEngage modules. Like so many CivicEngage communities, the City of Santa Rosa will continue to benefit from a flexible, customizable platform that evolves as this dynamic community continues to evolve, change, and grow. If you're ready to find our how your current city website design performs in categories such as readability, speed, and mobility, click below for your free third-party website performance evaluation report.